Running can be a lonely activity. For many runners, that's how they prefer it. Running solo is awesome but for safety purposes its best to run with a group or your four legged friends when possible. 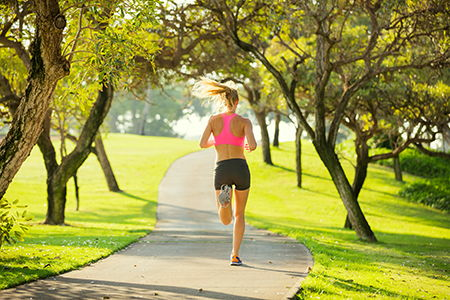 Let someone know that you are heading out for a run. Tell them where you are and when you start. Contact them when you return home. Use a mobile app that monitors your location so that friends and family can easily find you. Always be on the lookout for suspicious people. Leave the headphones at home. Trust your gut. If something seems off around you then your probably right. Wear clothing or apparel with pockets for your driver's license or another ID card and keys. Program your health information and emergency contacts in your smartphone. Invest in a RoadID bracelet. Read more here. Run during the daytime when there are lots of people around. Wear reflective gear or use a running light. Check your local sporting goods store or online for all the latest and greatest in running gear. If you have to run at night, be sure to run in well-lit areas and avoid dark alleyways. Don’t run the same route everyday. Predators watch for people who have a routine. Try running in different neighborhoods, parks, trails, etc. Carry an item that will protect you from an attacker or animal. Some runners feel safer when they carry pepper spray while others have been known to carry their keys. Have a backup plan in case of an injury or health emergency. Carry your phone with you so that you can call someone to help you. Register now to run, walk or volunteer for Rock the Block Run.